Mechanical Cider Harvest 2011 (Video), Using Littau small fruit over-the-row harvester at WSU Mount Vernon NWREC. Mechanical Harvest 2013 (Video), Using BEI over-the-row blueberry harvester at WSU Mount Vernon NWREC. Reduce Bee Poisoning (PDF) PNW Extension Publication 591, Oregon State University , December 2006. A review of Neofabraea malicorticis biology and management of anthracnose canker in apple orchards in the maritime Pacific Northwest, Garton, Whitney J., Lisa W. DeVetter, Mark Mazzola, and Carol A. Miles. 2018. J. Amer. Pomol. Soc.72(2):113-121. Evaluation of flower, fruit, and juice characteristics of a multinational collection of cider apple cultivars grown in the U.S. Pacific Northwest, Miles, C., J. King, T. Alexander and E. Scheenstra. 2017. HortTech 27:431-439. Regional variation in juice quality characteristics of four cider apple (Malus × domestica Borkh.) cultivars in northwest and central Washington. (PDF), Alexander, T.R., J. King, A. Zimmerman, and C.A. Miles. 2016. HortScience 51(12):1-5. Sensory comparison of ciders produced from machine- and hand-harvested ‘Brown Snout’ specialty cider apples stored at ambient conditions in Northwest Washington, Alexander, T.R., C.F. Ross, E.A. Walsh, and C.A. Miles. 2018. HortTechnology 28(1): 35-43. Yield, fruit damage, yield loss and juice quality characteristics of machine and hand harvested ‘Brown Snout’ specialty cider apple stored at ambient conditions in northwest Washington (PDF), T. Alexander, J. King, E. Scheenstra, and C.A. Miles. 2016. HortTechnology 26(5):614-619. Yield, labor, and fruit and juice quality characteristics of machine and hand-harvested ‘Brown Snout’ specialty cider apple (PDF), Carol A. Miles and Jaqueline King. 2014. HortTechnology 24(5):519-526. Anthracnose Canker Integrated Management Plan for Home Gardeners (PDF, FS297E), Information to manage anthracnose canker in the home garden or orchard in western Washington, where this disease can severely limit yield and in some cases leads to tree death. Anthracnose Canker Management for Commercial Apple Orchards in Western Washington (PDF, FS295E), Information for managing anthracnose canker, a major disease limiting apple production in western Washington, western British Columbia, and the Columbia Gorge. Hard Cider Production and Orchard Management in the Pacific Northwest (PNW 621) (11/2010), New basic manual for hard cider making, based on variety evaluations and cider trials at WSU Mount Vernon NWREC. 2015 Cost Estimates of Establishing and Producing Specialty Cider Apples in Central Washington, Extension Fact Sheet TB35E (11/2016). If you’re thinking of producing cider apples in central Washington, this publication will enable you to estimate costs of equipment, materials, supplies, and labor and also provides ranges of price and yield. This publication also helps you evaluate the feasibility and profitability of producing specialty cider apples in the region. An Excel spreadsheet version of this enterprise budget is available at the WSU School of Economic Sciences Extension website. Feasibility of Different Harvest Methods for Cider Apples: Case Study for Western Washington (PDF), WSU Extension publication TB32. 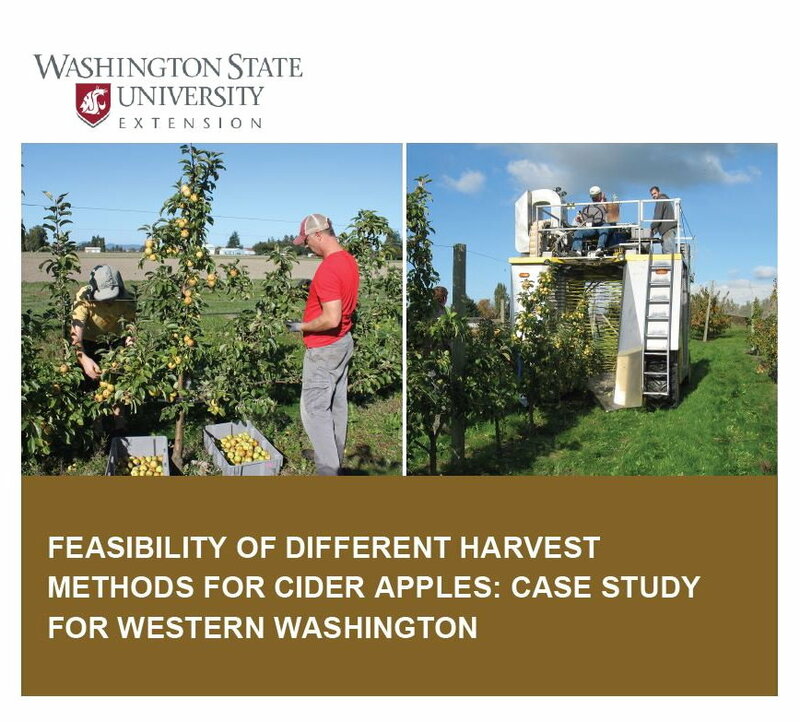 The results presented in this publication serve as a general guide for evaluating the economic feasibility of hand and mechanical harvest methods for cider apples grown in western Washington as of 2015. Cider apple bloom and productivity habit (PDF), C. Miles, T. Alexander, and J. King (2018). Cider apple varieties on trial at WSU Mount Vernon NWREC 2002-2017 (PDF), C. Miles, T. Alexander, and J. King (2018). Commonly Grown Cider Apple Cultivars In the U.S. (PDF) Twenty of the most common cider apple cultivars planted in cider orchards in different regions of the U.S. are listed. Information was collected from growers and researchers at 12 locations throughout the U.S.